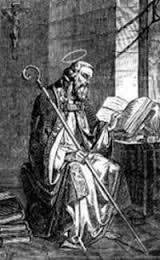 Hilary, orator, married man, bishop, monk, theologian, "the Athanasius of the West" was very much anti Arian heresy and pro the Trinity. Hilary is sometimes called “the Athanasius of the West” because of his efforts to combat the Arian heresy and his contribution to the doctrine of the Trinity. His life also had much of the rough and tumble of opposition and struggle. Patrick Duffy tells his story. Born at Poitiers of wealthy pagan parents, Hilary had a good secular education in rhetoric and philosophy, married early in life and had a daughter Afra. His reading of the Scriptures, especially the Prologue to John’s Gospel brought him to Christianity at the age of thirty-five. 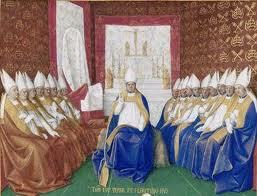 Three years later, while still a layman, he was elected bishop of Poitiers in 353. At this time Constantius II had become the sole emperor and was promoting Arianism. While Hilary avoided attending some of the pro-Arian synods, his opposition was known to the emperor, who exiled him to Phrygia for four years. Here he began writing the twelve books of his De Trinitate, translating into Latin the theology the Eastern bishops were expounding in Greek on the Nicene Creed. Eventually he was found to be so much of a nuisance campaigning in the East that he was sent back to the West. Welcomed back with enthusiasm in Poitiers, Hilary co-operated with Martin of Tours in combating Arianism in Gaul. In 364 he went to Milan to refute and hopefully depose its Arian bishop Auxentius. Auxentius managed to convince the Pope – Liberius – of his orthodoxy and Hilary expressed his thoughts in a book Against Auxentius. The positions of Hilary and Athanasius were eventually vindicated at the First Council of Constantinople in 381. 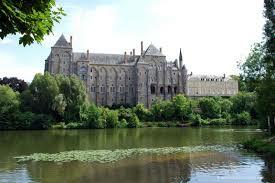 In 360 Hilary co-operated with Martin of Tours in founding the monastery of Ligugé, 8 km south of Poitiers, where today the famous abbey of the Benedictine monks of Solesmes is located. Although in character Hilary was gentle and courteous, his theological writings show a sharpness of tone against his opponents and are difficult to the point of obscurity. Hilary also composed some of the earliest Latin Christian poems and hymns. Worn out by his travels and struggles, Hilary died in 367. His feast on 13th January marks the start of Hilary Term (spring semester) at Oxford and Cambridge and in the Law courts.